Frank Corp. is available 24 hours a day, 7 days a week for emergency response. 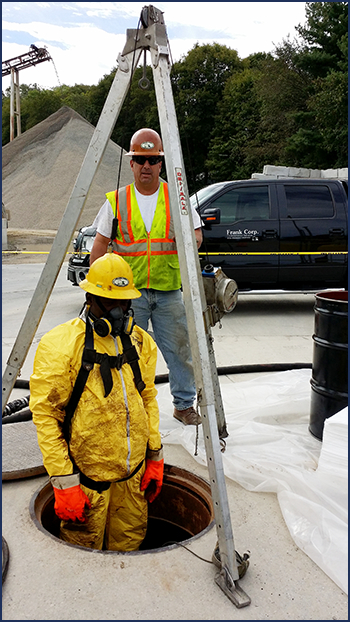 We provide a full range of environmental services to meet all your hazardous materials management and clean up needs. Licensed for hazardous waste transportation, with drum and bulk capabilities. All drivers have eight hours US Department of Transportation (DOT) training and on-going training. Disposal is always done at permitted facilities. Including oil filters, oil/water mixture, drum and bulk collection. Industrial clean-up including characterization, drafting site specific health and safety response plans, re-pack and lab pack, labeling, manifesting, shipping and proper disposal of all wastes. Developed to provide prompt, efficient, and professional response to waterborne oil spills. The barge reduces the cost of cleanup and diminishes the effects on the environment. Located in New Bedford, Massachusetts, this 25 foot, fully motorized emergency response platform is outfitted with Harbor/Sorbent Oil Booms, Oil Absorbent Pads, Lighting and Oil Pumping/Recovery Systems and more. It is ready to be deployed at a moment's notice in New Bedford harbor and the immediate vicinity of Buzzards Bay. It can be transported to other areas should the need arise. Environmental consulting and certified laboratory analysis are an important part of the services we provide. Our staff is highly trained for the wide variety of tasks they perform. This training includes 40 hours of OSHA training, OSHA Confined Space Entry Training, 8 hours US Department of Transportation driver training, writing of SHERP and industrial health and safety plans.